Diego Preciado, MD, PhD, an ENT surgeon at Children’s National and investigator in the Systems Biology Initiative of the Sheikh Zayed Institute will receive National Institutes of Health R01 grant funding for his research into the proteomic (protein based) contributors to chronic otitis media (OM), commonly known as chronic ear infections. This is the first R01 to be awarded to an Institute investigator. The grant is also unusual because Dr. Preciado is an otolaryngologist here at Children’s National. Research grants of this nature typically go to more traditional laboratory researchers rather than clinician-scientists. However, Dr. Preciado’s experience as both doctor and researcher uniquely positions him to perform this research work. As an ENT surgeon, Dr. Preciado sees first hand the number children suffering from chronic otitis media. Otitis media is one of the most common conditions of early childhood, accounting for a very high proportion of all pediatric visits to the doctor’s office visits each year. In the first years of life, most children will at some point will experience OM. For those who experience not just a single, acute episode, but rather ongoing, repeating infections, tympanostomy tube (ear tube) placement is performed. Due to the high incidence of OM in children, this surgical procedure to treat OM is the most common pediatric surgical procedure requiring anesthesia in the United States. Previous studies by Dr. Preciado and Mary Rose, PhD, in the Center for Genetic Medicine Research, have shown that the molecular profile of the ear (the amount and types of specific proteins in and around the inside of the ear) changes significantly when a child has an ear infection. The research team found that specific proteins within the ear appear to cause the secretion of a type of mucus (MUC5B) similar to the mucus in a child’s airway. They have identified a specific protein that, when present in large quantities, seems to signal the ear to oversecrete this mucus. The study is also the first joint project between Children’s Sheikh Zayed Institute, the Center for Genetic Medicine Research and the Clinical and Translational Science Institute at Children’s National to receive this type of prestigious NIH investigator funding. It is titled: Proteomic networks of MUC5B infectious/inflammatory induction in Otitis Media. This five year grant will allow Dr. Preciado and the team at Children’s to understand how this identified protein (Cxcl2) contributes to the additional secretion of mucus in the ear, and simultaneously look at ways to regulate or block the protein’s expression to see if they can find a way to prevent or reduce the onset of symptoms. The two-pronged approach of working to understand and simultaneously working to find better treatments is the type of translational scientific research that is very different from the traditional basic research pathway in a typical medical research setting. By working toward both goals at the same time, the team will gain better understanding of the body, and will more quickly find better treatments for children. In this case, it might mean finding a non-invasive way to help children with ongoing ear infections. The Sheikh Zayed Institute's initiatives have added an impressive roster of faculty in recent months. Key hires in bioengineering, systems biology, and pain medicine add to the already talented pool of doctors, engineers, and scientists here at Children's National. The new team members have wide ranging expertise, from the building of nanostructures (microscopic synthetic structures of a variety of shapes, including precise cubes) that could deliver targeted treatments within the body, to the design of computer programs that provide uniform, quantifiable evidence to assist a surgeon in deciding when a child with an abnormality requires complex corrective surgery. Learn more about them all in the media release. The Spring 2012 newsletter of the American Academy of Pediatrics' Provisional Section on Advances in Therapeutics and Technology features a short article authored by the Sheikh Zayed Institute's Education Director (and occasional guest blogger) Martha Houle, PhD. The story discusses how the design of our Joseph E. Robert, Jr., Fellowship in Pediatric Surgical Innovation aims to create a new paradigm for post-doctoral education by combining coursework about the business of innovation with that of pediatric health care research. 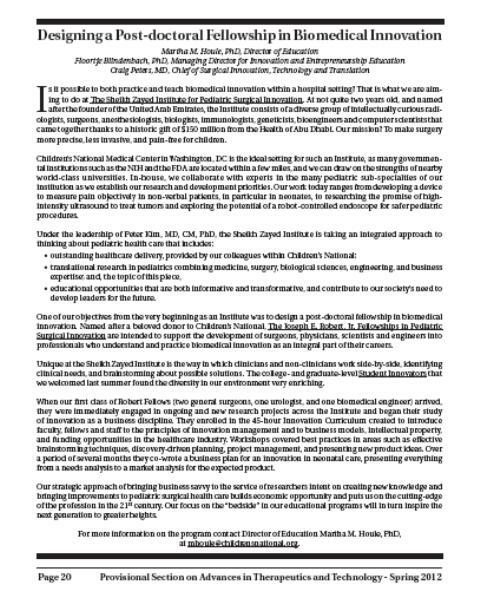 "Our strategic approach to bringing business savvy to the service of researchers intent on creating new knowledge and bringing improvements to pediatric surgical health care builds economic opportunity and puts us on the cutting edge of the profession in the 21st century," she writes. Read the full story on page 20 of the section's newsletter.